Hi everyone! I have more photos to share with you of Prairie Women who are attending the club meetings at shops in Indiana and Minnesota. First, let's visit the Shades of the Past Quilt Shop located in Clara City, MN. The morning group of Prairie Women are busy working on their Yo-yos as they journey to the past listening and talking about life in the nineteenth century. Looks like they're enjoying some goodies, too! Their first show-n-tell is of the third quilt in Journey 1 called At Mama's Knee. 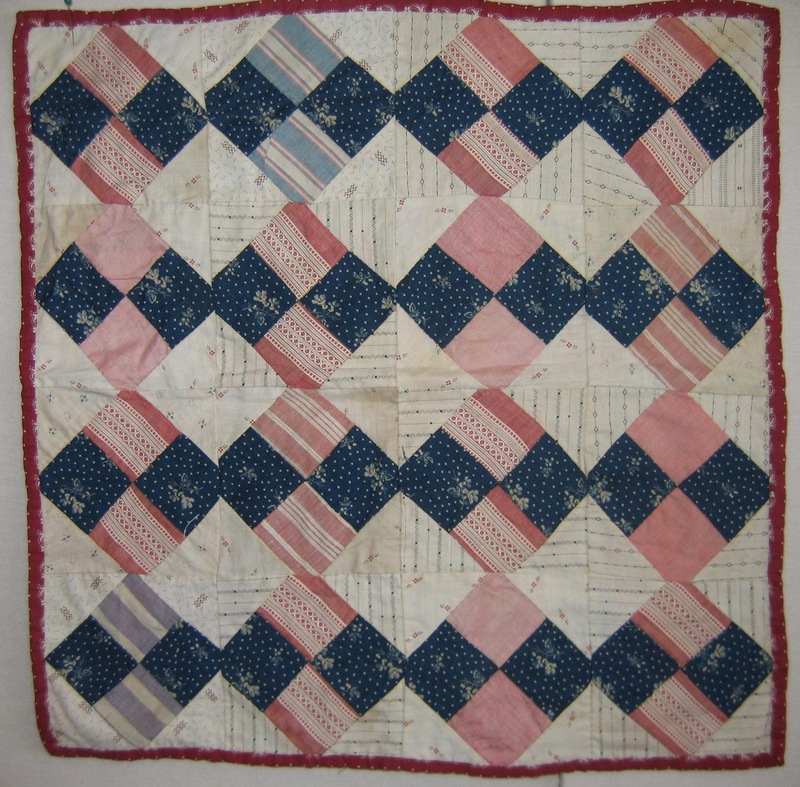 This quilt was inspired by the antique quilt that I own, pictured above. I chose to replicate it exactly as it is because I thought it was so sweet and perfect the way it was made so long ago. While I don't know for certain, I'd like to think that it was made by a child, or was someone's first quilt. Isn't it charming? It's also a perfect example of a Make-Do quilt. In a Make-Do quilt, we always look for a theme. 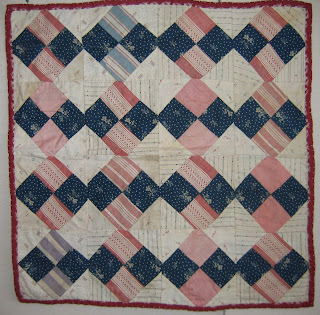 In this case, the theme is of a quilt made with shirtings and Four Patches of pink and dark blue. The Make-do blocks are the two blocks where light blue was substituted for the pink. Here's my version using today's fabrics. As a designer, it's wonderful to see quilters make a quilt just as I designed it...it really is. It's also fun to see the same pattern made with completely different fabrics. I really like them all! This is Susan. The quilt she is holding is a smaller version of Heartland Crossing which is the second quilt in Journey 1. Ladies....you all did a great job! 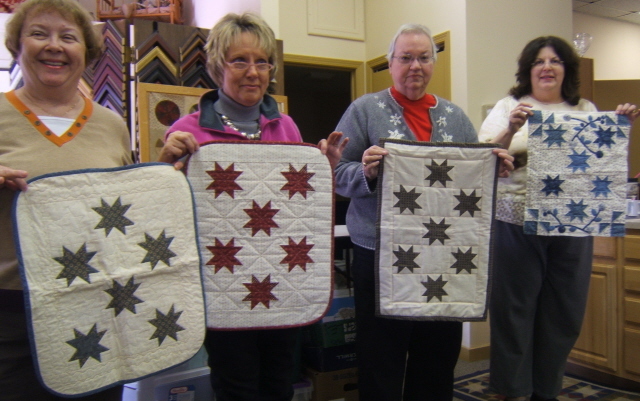 There are two large groups of Prairie Women who meet at The Back Door Quilt Shop and many more who participate by mail. The staff keeps them well informed with an email and photos of the club meetings. Another lovely verision of At Mama's Knee! 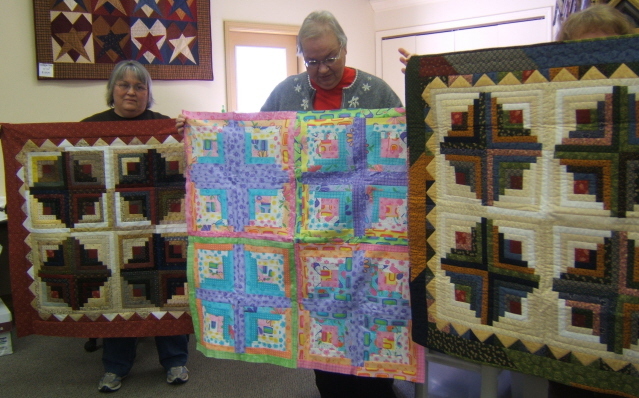 These ladies are showing off the first quilt in Journey 1 called Leap of Faith. I'm loving how each quilt is just a bit different and how they made the quilt their own - their way! 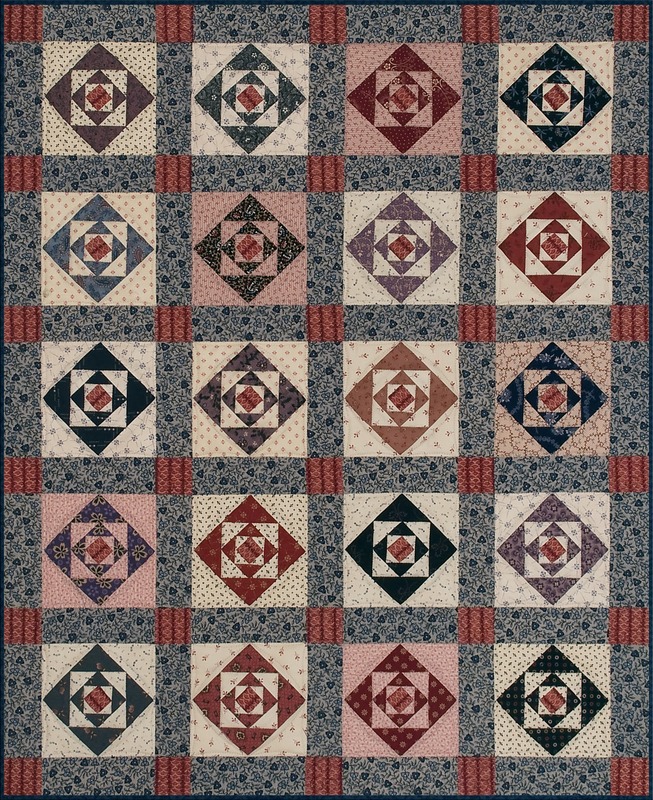 What an awesome collection of Heartland Crossing quilts. The quilt on the left was made just as I made mine. The quilt in the center is a bright and playful version! Love the scrappy border on the quilt at the right. Kudos to everyone! Hope you enjoyed it, too! Simply Charming is Simply Wonderful!!!!! I'm a firm believer in sharing something good be it a recipe, a neighborhood restaurant, a quilt shop...well, you get the idea. 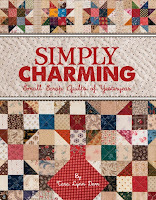 Over the weekend, my dear friend, Tara Lynn Darr came to visit me and brought along the 20 quilts that are featured in her new book, Simply Charming. I knew her new book was gonna be good, but she's outdone herself! WOW!!! Each quilt was more wonderful than the next. They are all small quilts like the one in the photo, and range from easy to a bit more challenging.....something for everyone! There's more than one (more like a dozen) that speak to me. "Make me now...make me now!!" I even dreamed of one that night! Don't be getting any ideas to call the authorities on me. Yes....quilts and fabric speak to me and I'm completely sane! Truth be told, you may think this post is completely bias. Yup....I guess you'd be right, but that doesn't make me wrong either! Every once in awhile a really great quilt book comes along where every project is delicious and wonderful, and you want to make them all. Be advised, dear readers, this is one of those books. Tara posted on her blog that the books have now shipped, so run to your local quilt shop and see for yourself. Would I steer you wrong? No way.....grab your scraps, start your sewing machines and enjoy!!! Contest Winner & New Fat Quarter Shop BOM! Hope you're all doing great today! It's snowing here this morning.....a very pretty snow with Arctic cold air to boot. Aahhhh....winter in the midwest makes you appreciate spring all the more! Anyway...on to important business. The random number generator chose #19......Kristine! Congratulations, Kristine!! Please email me with your address and I'll send the patterns and quilt kit to you right away. I was so touched reading your comments telling when you began quilting, who taught you to quilt and what quilting means to you. Such kindred spirits we are! I don't know about you, but when I'm quilting (read - piecing - as I don't quilt a thing) I feel very connected to the past ~ to our quilting ancestors. We're carrying on the tradition, albeit with rotary cutters and computerized sewing machines....still keeping quilting alive. There aren't many crafts from the nineteenth century still being practiced today. Don't know of any "wheelers" making wagon wheels. There are a few tinsmiths and blacksmiths, but not 20+ million active "smiths" out there like there are quilters. Amazing.....and so proud to be one of them! I am so jazzed to tell you about the newest venture from the talented ladies at FatQuarterShop.com! The new Designer Mystery Block of the Month is a flower garden theme! 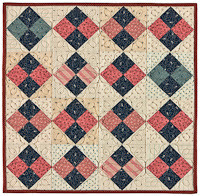 There are 12 different flower blocks featuring the new Strawberry Fields fabric collection by Fig Tree Quilts. 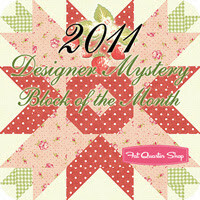 The featured designers who created the monthly blocks are Acorn Quilt & Gift Company, Anka's Treasures, Bonnie & Camille, Bunny Hill, G. E. Designs, Heartspun Quilts, Me & My Sister Designs, Miss Rosie's Quilt Company, Pieces from My Heart, Stitch Studios, The Pattern Basket, and This & That. I've seen a little sneak peek and geez.....it's really lovely! To check out this awesome exclusive Block of the Month - click here! Hope you enjoy your weekend and have some time to pick up needle and thread. While I'm not a sports fan.....far from it....I am a proud Chicagoan, and just have to say.....Go Bears! Journey 2 is finished & a New Contest ! Guess what? Journey 2 of the Prairie Women's Sewing Circle is finally finished!!!! YEAY!! I celebrated all weekend. The covers have been printed and I'm about to take the patterns to the printer. (Have to wait for a ride there.....ugh!) Anyway, I want to celebrate with a contest. 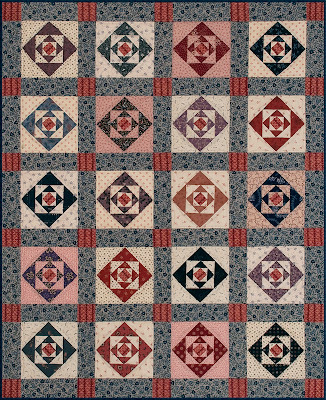 This quilt, called The Quilting Gathering, is one of the new projects in Journey 2. 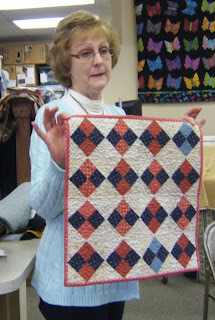 The story is about how quilter's in the ﻿nineteenth century made and quilted their quilts. This quilt has a paper piecing template which makes this block turn out picture perfect! Leave me a comment on how you learned to quilt...who taught you, how long have you been quilting, and anything else you'd like to share. What will you win? Well...how about a kit to make this quilt from the same fabrics I used, and the complete pattern set for Journey 2! Comment before midnight Friday ~ January 21st, and I will do the random number thingy to choose a winner. Can't wait to read your quilting stories! There's been an ongoing debate in my house. Perhaps you can help me! You see, I'm the proverbial multi-tasker. I have to be doing something, well more to the point....many things....at once. That's the only way I get to do all I have to do, trying to have a business and do my "mom" job. Can you relate? Well, there was a very long time span....maybe 20 years...when my kids were young, that I didn't read one book. I hate to admit that, but it's true! I wouldn't allow myself the time to just sit and read. I still don't. My mind wanders to the other things I should be doing. I know.....that's bad, huh? Then....about 5-6 years ago, I decided to try listening to books on CD, and well.....it changed my life. I can listen to the book and doing something else....multi-task! Now, I read about 20 books a year and love every minute of it! Right now, I'm reading this book.....The Help, by Kathryn Stockett. It's just wonderful. I understand it will be made into a movie....and it should. One of my favorite things to do when I read a book, is to be the casting director for the movie. Who would I like to see play the roll of Skeeter? Aibileen? Minnie? Do you do that, too? Of all the books I read in 2010, this one was the one I enjoyed the most. Envy, by Sandra Brown. I would love to see this one made into a movie, too. I highly recommend this book....what a great ride! Now...for the dilemma. There are some members of my family, whom shall remain nameless, who think that listening to a book is not reading a book. I maintain that I "read" everyword, and just because I used a different sense...my ears instead of my eyes....I most definitely did read the book. After all, I'm not listening to a Cliff Notes version! So, dear reader, let me know what you think about my dilemma. Do you take the time to read books? What books are on your recommended readling list? I've got some piecing to do today, and I hope to finish The Help, and return it to the library. Oh, yeah....I'm feeling much better! Yeay!!! I think I'm over the worst of the post-op recovery and getting my groove back. My back is feeling much better, and I want to do all kinds of stuff, but must pace myself. I'm just so grateful to have had such good medical care and had wonderful, tender loving care from my family. I'm also very grateful to all of you! Your comments and emails of well wishes cheered me up so very much. Thank you all for thinking of me. This week, I'm concentrating on wrapping up a lot of loose ends in my studio. I'm very excited to begin a new quilt project, and hope that by the end of next week, I can start digging in to it. It's a quilt I designed over a year ago that just had to be put on the back burner. You know how that goes! Are you working on something new? Do you make New Year's Resolutions? I don't make official resolutions, but I do make a committment to tackle new challenges each year. This year, I want to learn how to use the PhotoShop Elements software I bought, to learn several new computer techniques (for better blogging! ), and I will have the opportunity to learn how to make the Feathered Star block from reknown teacher Marsha McCloskey. I also want to try making bread from scratch. This was a late addition to my to-do list after reading the Blackbird Designs blog where Alma did this and fell in love with making bread. It just sounded like fun. So.... I invite you to leave a comment about what new things you've got planned for the New Year. This back of mine better keep gettin' better, 'cause I've got big plans for 2011! Sorry for the long absence from posting and emailing. I've been ill. Early in December, I was diagnosed with a small, grape sized cyst on my spinal cord...the culprit for the chronic back pain I'd been having. Surgery was performed on the 28th, and a golf ball sized cyst was removed. Recovery was described as - a couple of days rest, then you can resume "light" duty as you feel comfortable. Ok, I thought...not too bad. I can take it easy for a few days, knowing the first couple of days after surgery are the hardest, then I can watch movies, and stitch while spending time with my family sitting in my recliner. I think they forgot to tell me about the 'other' kind of recovery....the one I'm experiencing. Let it suffice to say I'd sooner go thru another knee replacement. This surgery has knocked me on my can. I'm doing a bit better now, and realize that I will spend alot more time on the road to recovery than I ever thought. Still, I feel very fortunate to have had surgery, that it wasn't something much worse and, as my mother always says....this, too, shall pass! I'll keep in touch as often as I can. Wishing you all the best of health and happiness in 2011.....and may you all find more time for the things you love!